Okay, I'm a grandma, but my rocking chair is covered with dust. Once in a while I climb in my hammock and rock while devouring a good book. Two years ago I went to Costa Rica for a month to study at a Spanish language school. It was fun being an international student, living with a family that only spoke Spanish. There is nothing like total emersion in a foreign culture to force you to speak the language. Last year Cuernavaca, Mexico beckoned and I went with the Elderhostel organization to another Spanish language school. I'm going to keep doing this language thing until I get it right! "Why don't we...?" " "How about...?" "Why not...?" These words are music to my ears. New ideas, new ways of doing things, different cultures and people are fascinating and stimulating to me. 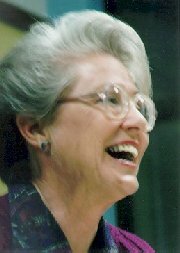 I am always looking for new possibilities or creative ways of doing the same old thing. I am addicted to learning and experiencing life to its fullest. That's my middle name. 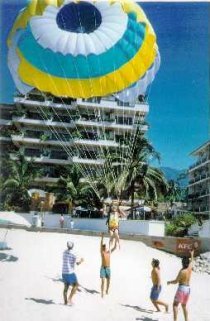 My 60th birthday present to myself was to go parasailing on the beach at Puerta Vallarta, Mexico. Okay, I admit it, it took me three days to work up the nerve to make the arrangements. Was it scary? Well, only while waiting for the take off. Hastily, I crossed myself and looked upward to the heavens. My guides flashed me a smile and said, "That's a good idea." Too late to turn back, I was off and rising in the air. The safety belts made a comfortable, secure seat. As I rose over the bay, I knew how the birds felt. The trip was so quiet and peaceful. I hated to see it come to an end. For my 65th birthday, I'm looking forward to a balloon ride over the Napa Valley in California. From that wonderful vantagepoint, I should be able to see the famous vineyards for miles and miles. (Is there some other way?